Pretty much every early model year Saab 9^5 owner is going to have to deal with this one sooner or later. The lever actuating arm on the recirculation control motor snaps off because of dodgy design and improper material selection. This one is a candidate for the “Made by Monkeys” blog at the Design News web site. 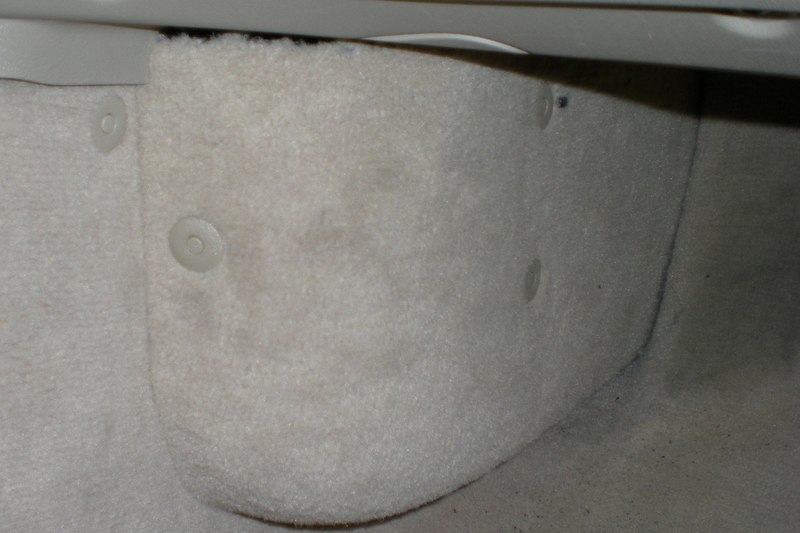 There are no symptoms except the A/C doesn’t work so well when first starting up a car that’s been sitting in the sun for a while, as the recirc flap defaults to fresh air mode when the lever arm breaks off. 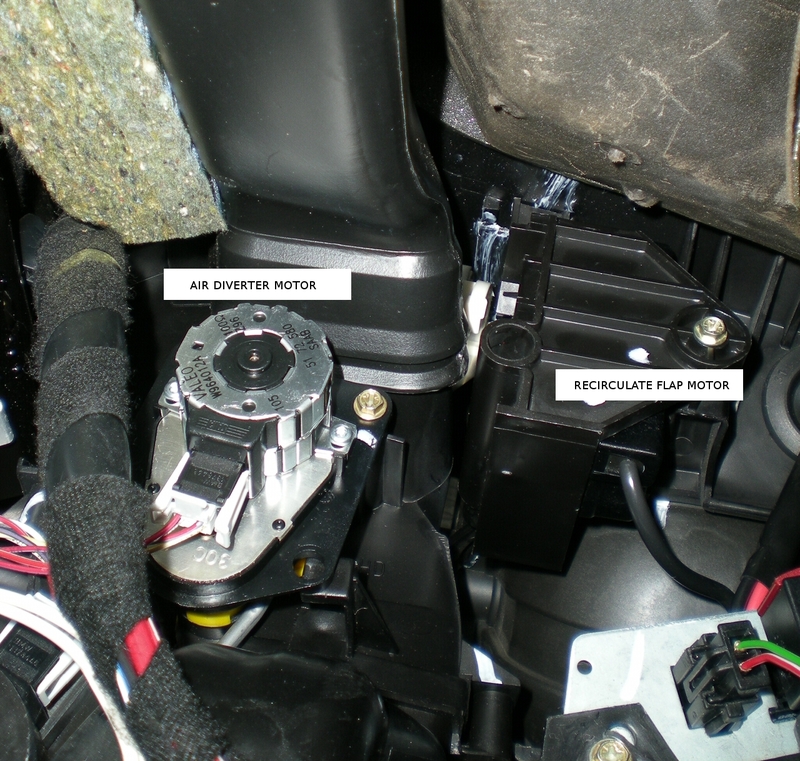 Replace motor and reassemble everything in reverse order. For early (pre-2001) 9^5’s it’s possible that the motor could be non-operative due to a burned out resistor. If your ACC calibration failed with a code 21 this indicates a failed recirculator motor. 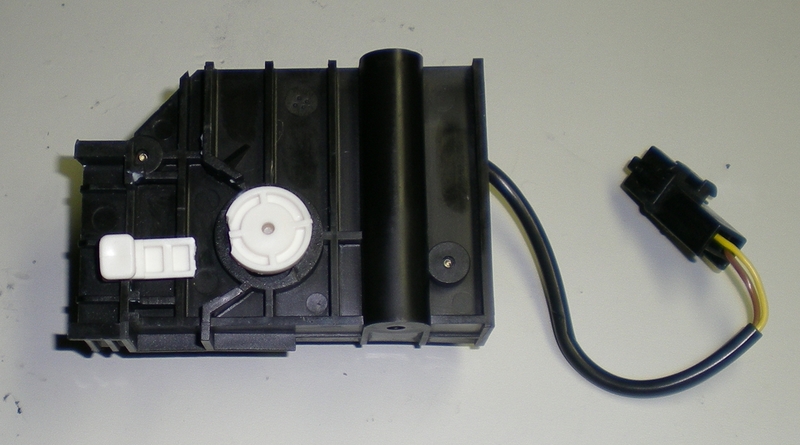 Replacement may be your only option on the later cars as mine (MY2001) has the motor sonic welded together, there’s no practical way to disassemble it to replace the failed 18 ohm resistor that tends to happen on the early cars. 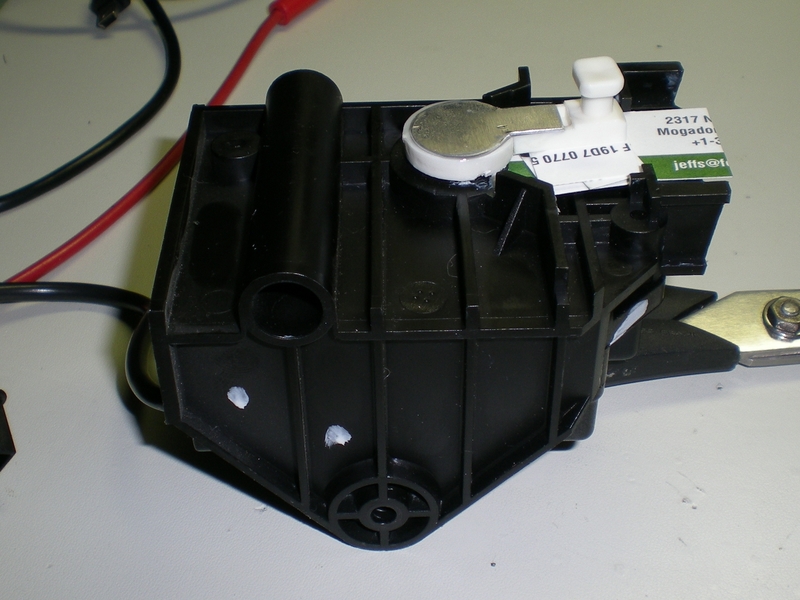 It’s easy enough to test the motor on the bench with a 12V power supply. Apply voltage one way, then reverse the polarity to move the motor back in the other direction. You will need to do this in any case in order to move the shaft to a middle position if you effect the repair I listed below. A replacement actuator arm part (part number 4869426) can be found at www.gmpartsdepartment.com for about $USD20 last time I checked. Since this didn’t look like too much trouble to frig a repair, and the force needed to move the recirculation flap is pretty small, I decided to try a fix. WARNING: don’t try to forcefully pull out the 3 clips! They come out really easy if you know the secret: use a small screwdriver and push in the center pin about 1/8″. It should click and stop. At that point the clip is released and should just pull right out. For reassembly, push the center pin out from the inside of the clip. 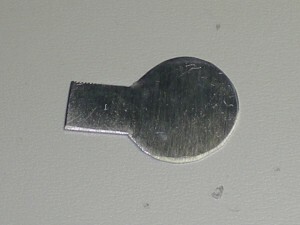 Insert the clip and pin back into its hole, and depress the center pin flush in order to lock in the clip. 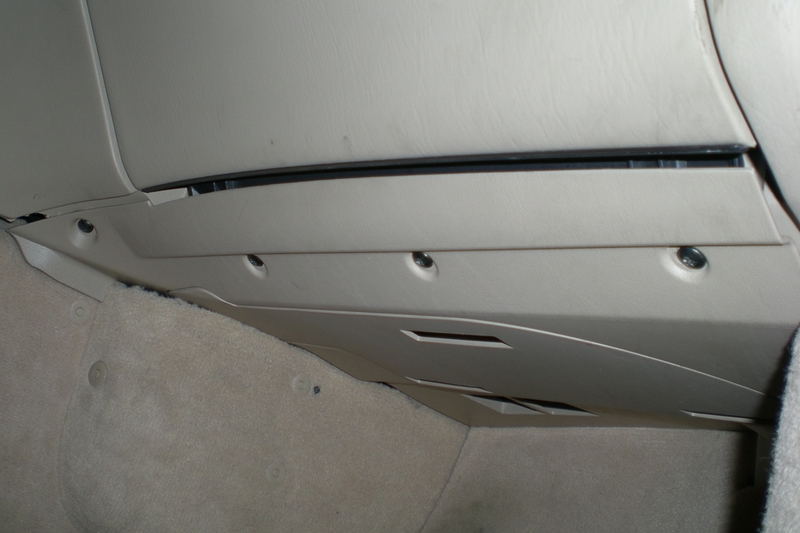 (Sure wish we had these on the Saab 9000!) 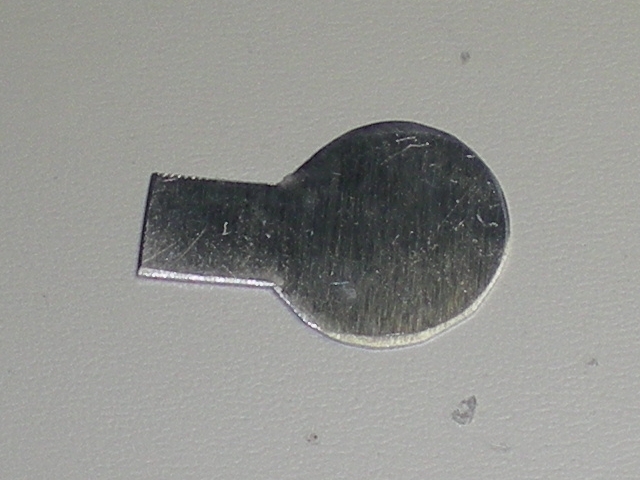 Remove the cover, and note the locating pin behind the upper plastic clip. 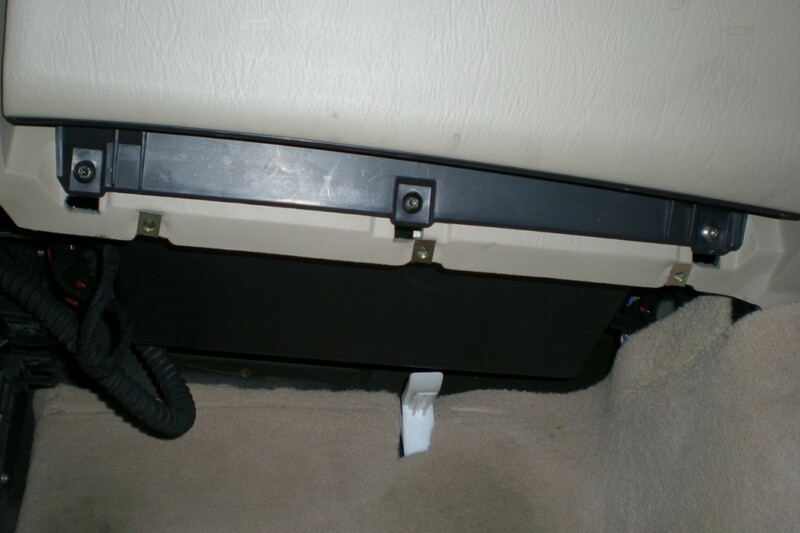 Gently pull the glove compartment forward, and disconnect the two leads for the glove compartment light and the small hose for the cooling air. 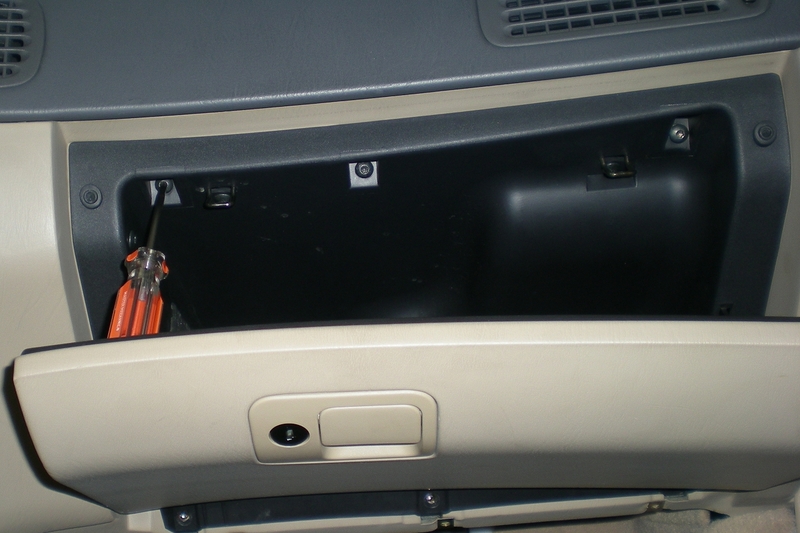 Remove the glove compartment from the car, and now you should have full access to the right side of the air box. 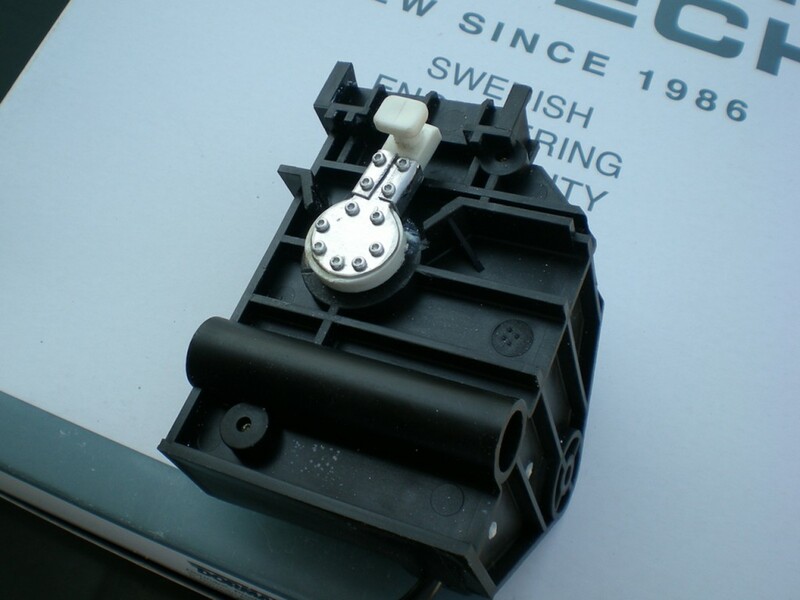 Disconnect the electrical connector for the recirculation motor, and remove the connector from the bracket. Remove the two 6mm/Philips screws holding the motor in (the left screw is deep inside the boss shown, use a #2 Philips on this one) and remove the motor. Replace the broken actuator arm and reassemble. Or, if you are cheap like me, repair the arm and then reassemble. I used a clear epoxy. JB Weld would probably work as well. Shim the broken arm in place until the epoxy sets, then remove the bits while you still can to keep the epoxy from creating a mess by sticking to the shims, then be patient and let the epoxy fully harden. To ease reassembly, use the power supply to run the shaft to its full CCW position (this is the default position of the recirculator flap).